In its first six months since starting up, Unity Logistics, a Rotherham-based international shipping agency, has already shipped goods across Europe, Asia, North and South America, Australia and Africa. Taking space at Hellaby last year, the enterprise specialises in road, sea and air freight forwarding operations and are members of the British International Freight Association (BIFA) - the trade association for UK-registered companies engaged in international movement of freight. Recent clients for Unity include a leading UK supplier of flat pack furniture, a specialist car part manufacturer and a high end online retailer. Simon Arnold, co-founder and director at Unity Logistics admits that he "fell into the world of freight forwarding and hasn't looked back since." On starting up in business, Simon said: "Six months ago I found myself unemployed but determined to make something happen. After a lot of work and sourcing some external investment the dream is becoming a reality, and we are excited to keep pushing ourselves to see just how far we can take it." After securing a degree in degree in business in Sheffield, Simon has previoulsy work for freight forwarding firm, 512 on the Sheffield / Rotherham border. 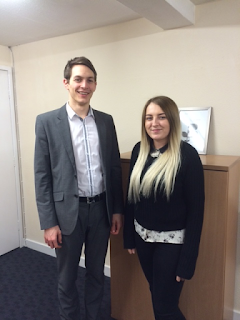 Partnering director to Simon, Emma Jarrett, also comes from a background in freight forwarding. At just 24 and 21 respectively, both already have a few years' experience each in the industry. Emma Jarrett, co-founder and director at Unity Logistics, said: "At such a young age this is an incredible opportunity for us and we are proving that we are very competent at what we do; and we have already shipped goods to or from five different continents." Helping businesses to arrange their international transportation, the firm is preparing for new regulations surrounding container weight verification that come into force this year.